Here it is--the classic Scotcheroo. One bite of these and they will take you back to lunch box treats, after school snacks, bake sales, or just because someone loved you (and hopefully still does). 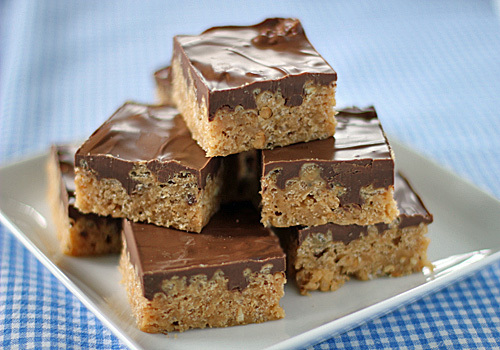 Chocolate, peanut butter, butterscotch, and Rice Krispies--what's not to love? As good as they are when you stick to the original recipe, I like to double up on the chocolate-butterscotch layer. In my opinion, it is a much better chocolate to crisp rice ratio. I also use crunchy peanut butter instead of creamy for a little extra texture. The secret to the perfect bite is to not press the rice cereal layer firmly. I like to leave the rice cereal mixture with hills and valleys so the melted chocolate layer can fill in the gaps. This is also a no-bake recipe, so the kiddos can help out in the kitchen. Whatever your reason for making them may be, just be careful. One bite of these and you will be tempted to eat the whole lot. So, do what I do and quickly package up a few bundles and share them with your neighbors. They will love you for it! Line a 9x13 pan with aluminum foil, leaving overhang on all sides for easy removal. Spray the foil lightly with non-stick spray. Place the Rice Krispies in a large bowl. In a medium saucepan, bring the sugar and corn syrup to a boil, stirring frequently. When the sugar has completely dissolved, remove from the heat. Add the peanut butter, stirring until completely smooth. Pour the peanut butter mixture over the Rice Krispies and mix until thoroughly combined. Gently spread the mixture into the prepared pan. (Do not press the mixture into the pan) Set aside. In a microwave-safe bowl, melt the chocolate and butterscotch chips for 1 1/2 minutes; stir. Continue microwaving at additional 15 second intervals until the chips are completely smooth. Pour the mixture over the Rice Krispies layer, spreading evenly. Set aside until firm. Using the aluminum as a sling, remove the Scotcheroos. Transfer to a cutting board and cut into 1 1/2 x 1 1/2 inch squares. Enjoy! I actually never had a scotcheroo until High school when someone made them in our cooking class. Since then I have fallen in love with them. They are such a great and easy treat. Good timing. I have to make a dessert for a ski group pot luck dinner tomorrow night and this will be perfect. I agree with you--they are delicious. I think these will be perfect for your ski group pot luck. Sounds like fun! Oh my. I hope my kids won't see this post or I will have to make it right away. They would love this treat. Filled away to try! Thanks. Don't let your kids see this post. Instead, surprise them with this treat. They will love you even more! Oh man. These are one of my favorite childhood memories and now I make them for my friends! However, can I ask what kind of butterscotch chips you use? I've tried making them recently and it seems that the butterscotch chips never melt. I just use the nestle ones or whoever makes them but I was wondering if there was a better butterscotch chip out there. I have used both Hershey's and Guitttard's Butterscotch chips with equally good results. Butterscotch doesn't melt like chocolate and can burn easily. To facilitate its melting properties, the chips need to be stirred frequently with the melting chocolate. Also, make sure that no added water or liquid gets into the melting mixture otherwise it will seize and harden. Thanks for the question. I love scotcheroos! I always want to make them but never have the recipe! Thanks! My main reason for this blog was to keep track of my recipes for my family, but I am glad that I am able to share them with you too. Enjoy! I grew up with these and now make them for my own family. I never heard the name before- so I guess now I have a name to go with that face! They are delicious, and I will be sure to try it with the crunchy peanut butter. Scotcheroos--they are fun to say and fun to eat! Oooooh these look fantastic. The adaptations in the recipe look scrumptious, combining all things good. Definatly to good to pass up. Great post. I was one of the very lucky neighbors to receive a package of Scotcheroos from Nicole and all I an say is "Life is Sweet." Thanks, Nicole!! Now, I'm trying to make them on my own. Wish me luck. What if...what if...you made them with Cocoa Krispies? !